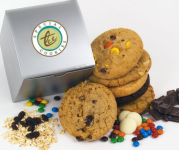 We have ordered cookies from Tee to be given as special gifts for our donors. They always LOVE them and are the best around. I order on a personal basis too for friends and family and they can't get enough of them.